I recently followed my mum to the hospital to have an x-ray done. As it was quite sunny before we left the house, adding on layers of clothing or even a cardigan to go didn’t seem like a sensible option on a typical London summer day. Besides, she assured me it was going to be a quick hospital trip, and wouldn’t last more than 2 hours tops. On arrival at the hospital and after filling relevant paperwork, mum was told to go to the x-ray reception hall and wait to be called. Barely less than five minutes of sitting in the x-ray waiting room, I realised the temperature in the room was set to almost freezing point. I guess they must have increased the room temperature to the highest because of the summer heat – This was the only explanation I could come up with as I started to shiver uncontrollably. ‘I told you so… but you never listen to me’. Accepting my fate, I tried to clasp my palms together hoping that I would generate enough body heat to make the cold bearable. But with a short summery dress that was over my knee and a flat sandal to go with it, I knew no amount of hand clasping would boast my body heat in that waiting room. “Would you like to have my jacket? I think you need it more than I do”. “I am going in for my x-ray so you can hold on to it until I get back.” She added. At that instant, I made a silent prayer thanking God for once again sending an angel to my rescue. “Thank you so much. I would really appreciate that…” I replied as I grabbed the jacket from this Guardian Angel of mine. It wasn’t until she stood up that I realised the extent of her injury and why she had the jacket covering her upper arm. She told me she had being in an accident the previous week which dislocated her shoulder and left her with a couple of bruises on her upper arm. Not being a fan of going to the hospital, she had not sought proper medical attention. She however decided to turn up at A&E on this particular day after a week-long excruciating and unbearable pain. Also, she had no choice but to give in to the pain as no amount of over-the-counter pain killers was able to relieve her pain. I also learnt that she had been sitting and waiting to be called for over two and a half hours because she didn’t have an appointment booked in. I was shocked that inspite all the pain she had to endure while waiting for hours to be called, not only has kept her composure but also wore a radiant smile like all was well in her world… You know the kind that makes you forget all your worries and you too manage to reciprocate with a half-hearted smile. Aside from this, having witnessed me in distress from behind (since she was sitting directly opposite me) she was kind enough to share a jacket with a total healthy stranger in a hospital. How ironic was that? The act of kindness demonstrated by this kind-hearted woman kept me thinking all through the hospital trip and on the journey back home. I tried to remember the last time I performed an act of kindness to a complete stranger. I thought about the impact it would make in the lives of people if we all determined to perform one random act of kindness each day for the people we meet whether on the road, bus, train, shopping mall, workplace … You name it!. It could be as little as offering your spot on the queue to someone you think could use it to complementing a stranger or assisting a colleague to work on a task even though you may not receive any credit for it. 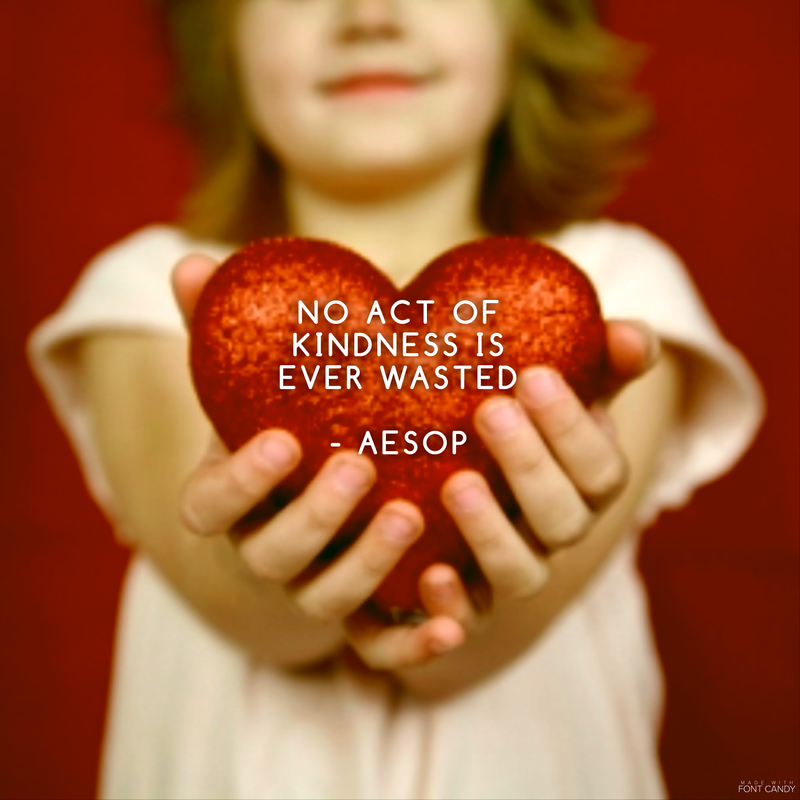 So when was the last time you performed a random act of kindness to a complete stranger and how did that make you feel? I am sure it made you feel good about yourself right? So now think about when a complete stranger showed you an act of kindness (whether in a difficult situation or not). I am sure it not only surprised you but also made you feel appreciated and good about yourself too right? Isn’t it nice that no matter how little or insignificant a random act of kindness is, it does leave both the giver and receiver with mutual feelings of happiness, gratitude and a heightened sense of self-worth. I hope you never pass up an opportunity to show random acts of kindness because not only will you be making someone else’s day better but also yours as well. I have read that a day has the potential of becoming more beautiful than it already is when kindness touches it. So pay it forward today and let kindness start with you because your random acts of kindness has the power to leave an impact and change the world one person at a time, one day at a time.